We take the environment into account in our entire operation. For example, we try to reduce the amount of raw materials we use. The reuse of rainwater is one example of our environmentally conscious activities. We have designed a system to collect the rainwater from our greenhouses which is then used to spray the flowers. We also make use of a so-called combined heat and power (CHP) installation: the cooling water is used to heat our greenhouses, exhaust gases are cleaned and the carbon emissions that are released are captured and used to grow our flowers. Any electricity that is not used goes back into the electric power grid so that it isn’t wasted. Natural pest control is another example of our sustainable efforts. Organic plant protection strategies are used as much as possible. We use insects to control other invasive pests and are constantly searching for opportunities to further our knowledge in this area. Furthermore, we do not use neonicotinoids. This allows useful insects such as bees to survive. VHC also keeps a record of pesticide application and monitors pesticide residues in the plants on a weekly basis. Our commitment to people and the environment has not gone unnoticed. 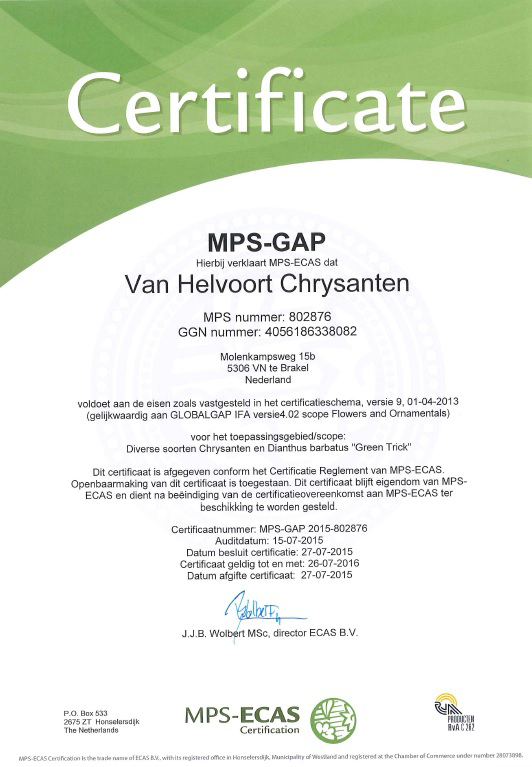 We have been awarded the MPS-GAP certificate, which means we are recognised as a leader in producing quality products using socially and environmentally responsible growing practices. By focusing on sustainable cultivation, we are able to meet even the most stringent needs of our customers.